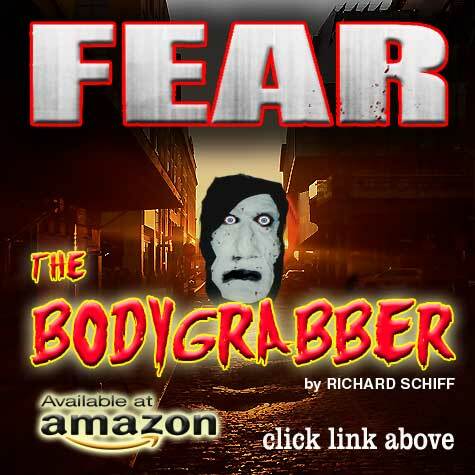 New Novel by Richard E. Schiff - a horror tale set in 1970 in Greenwich Village! The election of Donald Trump, by a minority of voters, has made him President, of the most ignorant nation on earth. I hear people of Color tell me it has them "afraid", and righteously they are. 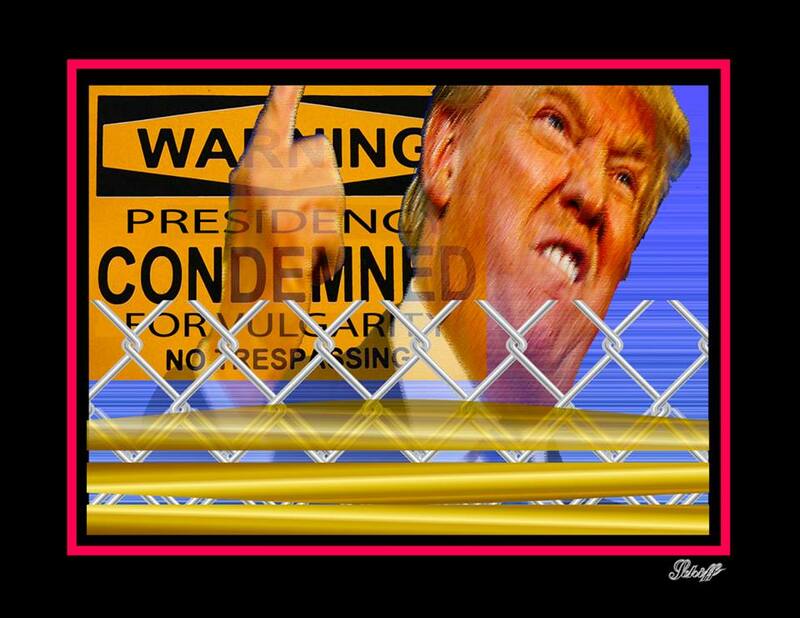 Artists need to rally to the forefront to denounce Trump as the lyin psycho Moron he is. Only Artists have the stamina and Moxie to tear at the fabric of this Usurper. Join me and others, to make his stay at the White House most uncomfortable. I urge all artists to create works portraying Trump. American Universities saw a wonderful opportunity in the mid-20th century, offering Art Degrees to the growing number of students being convinced they needed college to succeed in the world. Prior to this turn of minds, serious students of art were trained solely in the studios of Masters they would Apprentice with, or Vocational Art Schools that did not offer any degree or any certificate, but they did offer that you would study art with a person who was already a success, great or minor, in the world of Fine Art. The work I now see coming out in New York is academic, when tolerable, infantile, when insufferable. Today artists are unaware that prior to the 13th Century, artists were stylists, not realists. Stylization gave us our written forms, simple graphic icons derived from centuries of complex pictographs. The emergence of Optical lenses in the early Renaissance saw Patrons demanding more representative images for family portraits and such. Only the invention and proliferation of the Photographic camera in the Mid-19th Century freed the artists to begin the experiments in form and color that was their original birthright. Work created by Piet Mondrian in 1917 has influenced the Industrial Design and Architecture for the last 100 years. No longer is the goal to continue the progress that began with the Impressionists, and the Post Impressionists, the Expressionists, Surrealists, Dadaists, De Stijl, Bauhaus, Minimalists, Pop Art and Op Art. The first movement that appeared signaling the demise of all progressive modern art came from California, the ultimate surrender to “Imitating Appearances” ever acknowledged as art, emblematically named, “Photo Realism”, at which John Sloane surely turned in his grave. This Photo Realism, or cheap copyism, came from University trained artists. Pop art and Op Art, and all the aforementioned emerged from vocationally trained artists. Recently I saw an advertisement for an art show that heralded it as representing all “MFA Artists”. And I was horrified. New art schools cater to those convinced being an artist means copious drawings of nudes in conte crayon; drawings made in the rudimentary drawing classes of a place like the Art Students League of New York, where no certificates or degrees were offered. America is a huge nation. Sadly, regionalization was not a natural thing, it was brought on by a shift in real estate values. New York, Philadelphia, Chicago, San Francisco used to be low rent area and artist could gather there affordably and be near their schools and galleries and more importantly, near one another. That was how movements grew. Cheap spaces encouraged experimental art, theatre, music, dance and poetry. The corrupting power of Greed was never as apparent as it is in the coyly termed Gentrification of our Cities. We have allowed the demons of Capital to tamper with and destroy the very incubators of all our past creativity, the affordable cities that gave us the likes of Michelangelo, William Shakespeare, Gershwin, Van Gogh, Renoir, Mondrian, Juan Gris, Georges Braque, Leonard Bernstein, John Sloan, Jerome Robbins, George Bellows, Edgar Allan Poe, The Rolling Stones, Lou Reed, Edward Hopper, Andy Warhol, Bette Midler, The Beatles, Theodore Dreiser, James Jim Henson, McNeil Whistler, John Sloan, Barbara Streisand, Will Barnet, Amadeo Modigliani and all the great artists of the past. Our world is being cheated. New York City has lost its eclecticism; now it is the playground of a few rich families. This has cost the Nation much. We have sacrificed the environment that gave young artists affordable housing, studio space, and experimental theatre space. Now, the arts have reverted back to the sickness of, as American painter John Sloan called it, "the disease of imitating appearances." In the mid 1960's New York City, for the first time, took the title of "Center for The Arts" from Paris. We were strong in Modernity, the avant garde. Soon, this shortsightedness will bring a dirth of labor who live conveniently enough near Manhattan, making many services unavailable to these scions of Wealth, whose main reason for living in Manhattan, is their fear of the world at large. Now, the images of the neighborhoods that spawned great novels, films and plays, is scarred with bourgeois architecture and grilled cheese sandwich "salons". This is very sad and the reason entertainment has now fallen to all time lows. And, the register of Homeless New Yorkers has grown exponentially. "Well, Stanley, this is a fine mess you've gotten us into now!" As an artist, trained in classical drawing and oil painting, in the mid-20th Century, I turned to abstraction in 1968, having become a follower of Piet Mondrian. In fact, my real work in abstraction took flight in my studio in Amsterdam, Netherlands. It troubles me that, artists are kept out of living in Major Cities. They now cater to the Wealthy Gentry, leaving the progress of Modern Art into an abyss. After all, photography clearly took away the slavery to photorealism, and since 1850 the world of painting became alive with real experiments, impressionist, post-impressionism, expressionism, fauvism, modernism, that required originality and a careful return to the role of "stylist" not that of a documentary taker of that which exists before our eyes. Then in 1917 came De Stijl, and the artists who made that movement great, Piet Mondrian and Theo Van Doesburg. By 1950, many artists were creating original works. The Museum of Modern Art was a place that all young artists went to feel the reach of modernism. Architecture honored the geometric plasticity of form, and reached out through Frank Llyod Wright and Gerrit Rietveld. They made buildings that were extensions of their human nature, knowledgeable about art history, they did not copy past ideals. Rather, they took the bull by the horns and found an idiom they could apply. Today, modern, crass, distortions akin to Gaudi, but done in glass absurdly, sit upon copies of French Renaissance buildings of the 19th century. The obvious lack of art communities has affected architecture. After many years of CIA influence, abstract expressionism gained an unnatural favoritism, that was built by the CIA to show the Soviets we tolerated absurd “modernism”. Sadly, no one told the buyers about that, so they fell hook, line, and sinker for work that defiled many traditions, even good drawing was eliminated. By the mid 60’s Pop Art reinstated figurative images and helped restore plasticity to the Rectilinear Composition. Then came Minimal Art, straight from California, again, a movement in direct progress, from the early work of the 20th century. I recenetly made a short film to show some of my recent work off, and especially as I am reminded always that I am creating for the present and the future. Sadly, most work I see seems to be creatred for the audiences of the 19th and early 20th century, with very little concentration on the new environments and tools of today. I would ask that you take a minute out to see this project. Somehow, I have the privelege of being present with work in some of the numerous annual Outreach Exhibitions mounted by Leah McCloskey for the Art Students League of New York. I have, no doubt, exhausted my praise for the League, but I write to say "art is alive and well" at the Art Students League, and the shows are filled with some extremely brilliant works. Currently I have a piece in the 2nd Annual Summer Show, hosted by Scott Springer, Manhattan's Borough President, and current candidate for Comptroler of NYC opposed by Elliot Spritzer, formerly disgraced Governor of the State of NY. 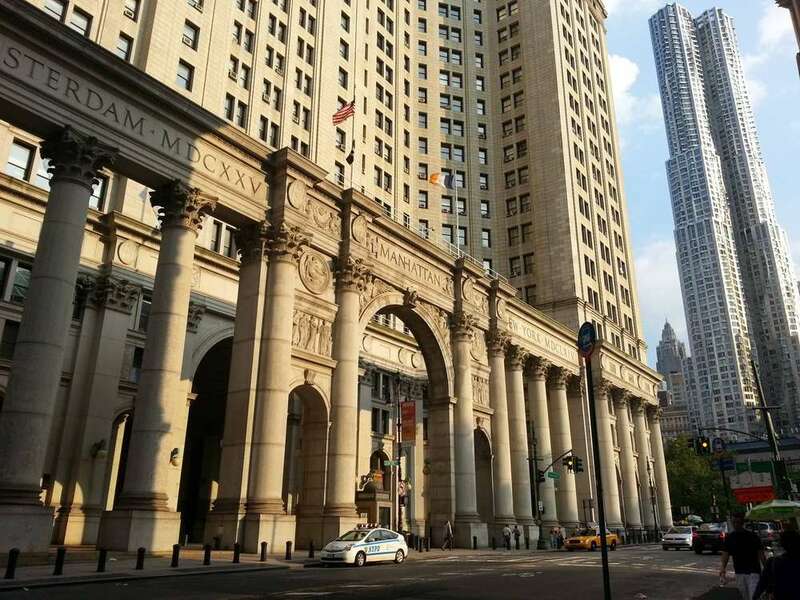 On the 19th floor of one of Manhattan's wonders of architecture and engineering prowess, #1 Centre Street! When you enter the great brass gates, and sign in, at the long diagonal desk, that points arrow-like to the entrance of the Gallery. You are then surrounded by a beautifully hung expansive view of art from many diverse, all professional, artists with works that go from the Classical to the most ultra modern digital works. If you are a serious, or a beginning collector, or seeking a weekday entertainment, catch the Summer Show at the Manhattan Borough Presidents Office and for very little money, avail yourself of an original work of art from a bonafide member of that very prestigious and long time champion of Art Education, that influenced world art education. Only recently, reading a biography of American artist John Sloan, did I realize that the gentrification of the great old American cities has destroyed the very platform upon which artists forged not only professional careers, but the very foundation of all modern art. Low rents were available across the wide range of American cities from the end of the Civil War in 1865, through the early 1970’s, and that 105 years represents the full emergence of Modern American art. As a young man starting out at the Art Students League, as a full time student, in 1965, I rented a studio apartment on Morton Street in Greenwich Village for $50.63 (yes, change was part of many rents). My landlord was Mr. Levine, owner also of Levine’s Paints on 7th avenue south, just north of Sheridan Square. That was when the Village Voice was in an old two story building at the northeast corner of 7th and Waverly. 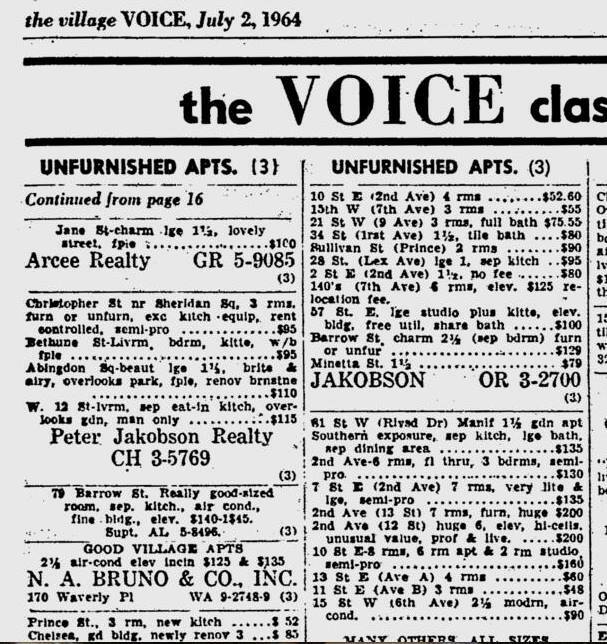 My reason for including that anecdote about the Voice is that is where we late 20th century apartment hunters found our “castles”, (affectionately still called “pads”), every week, in the classified. Every Wednesday evening at about 7:00pm, a runner would emerge from the Voice office carrying a bundle of newly printed papers to the newsstand still on 7th today next to the IRT station. That was where I found my place, and rented it the next morning. First, imagine this happening today; I am dressed in my ragged blue jeans all festooned with sloppy paint wiped on them by this 18 year old, with scruffy long hair. “Oh no, Sir! I do all my painting at the Art Students League. I simply want to live there.” Sure. See no landlords wanted artists, or so they claimed, but we all had “pads” and all of us painted in them. As acrylics were not readily available in a full range of colors, most of my peers still worked in oils. That was the complaint, the fire danger of turpentine paint rags, stinking up the building and potentially proving destructive. It was well known that if you stuffed bath towels in the door cracks, the smell of the turpentine stayed mostly in your room. This apartment was affordable. You could make $50. per week on any temporary part time job, and one week’s pay was one month’s rent. Please do not think I was the only person able to secure such an inexpensive life style. There was a theory extant that many called ”The Unwritten Law of Labor”; no one’s monthly rent should ever exceed 25% of their income. That was how all people lived back then. Believe it or not, there was no such thing as Homelessness. Though I paid a “high rent” of $50.00, my fiends lived on the lower east side off avenue A, in 4 room railroad apartments for $22., some for a little more or even less. One friend had a huge loft on Broome Street for $60.00 a month. Another for $30.00 on Great Jones Street, a block south, off Bowery. Bowery is a Dutch word for “sheep grazing land”. The men you saw on the Bowery by day lived by night in any one of the long row of flop houses, stretching from Astor Place to Houston Street, where beds could still be had for as little as .50 cents a night. Some offered showers for $1.00 a night but the Saint Marks Baths were only a couple of blocks north. They were not homeless, often badly deteriorated alcoholics, who had been, Professionals; i.e. Doctors. Lawyers, Dentists and movie Directors. If they could hold down any kind of part time work they would never be homeless. Consider the lives of the artists familiar to all, in Europe and in the United States, who worked in the late 19th century and the early 20th century. The artist I mention in the opening paragraph found a great studio in Greenwich Village on Waverly Place in the early 1900’s for only $100. It was two floors. I rented one half of a huge basement in the same building that Sloan and his wife Dolly moved into in 1903; 240 West 4th Street, and I paid $60.00 for the entire space. I had a backyard, as well, by the way. That studio space allowed me to produce the work in the quantity and sizes required to show in Avanti Galleries off Park Avenue in the early 1970’s. Space like that is a pre-requisite to practice serious painting or sculpture. When we allowed changes in the evaluation of real estate in the late 1970’s, we sold out all the progress that made Impressionism, Post-Impressionism, Cubism, Synthetic Cubism, Fauvism, Futurism, Surrealism, Neo-plasticicity, Expressionism, Abstract Expressionism, Pop Art, Op Art, Hard Edge Abstraction, and Minimalism, possible. Artists cannot develop correctly kept away from the Museums and Theatres, the Concert Halls. When artists are forced away from one another because of Gentrification, the creation of art movements to carry on the work that ended in 1973, will never exist again. All the great artists of the past came from the great old cities and they rose to the top because their environment lent itself to their development. Since the artists were driven from the inner cities by the Rich, art has been doled out to the Universities which never could compare to, The Art Students League of New York, The National Academy of Art, in New York. The Pennsylvania Academy of Fine Art, in Philadelphia. The Ecole des Beaux Arts, in Paris. Der Rijksakademie Van Beeldende Kunsten, in Amsterdam, or the Chicago Art Institute. If we detect a shortcoming of quality in commercial entertainment, that favors vulgarity to studied communicative expression; comic or tragic, it is because there is no way for a Bette Midler to rent a flat on Bedford Street in 1965 for $60.00 and work her way to the Broadway Stage and on to a major career as an International star of music, stage and screen, affordably. Affordability was why we had The Marx Brothers, The Gershwin Brothers, Nick Adams, Frank Sinatra and every other great artist of the 20th Century. I must admit, I acquiesced to the idea of “regionalization” when I left New York in 1975 in search of cheap rent. It did get me to teach many the skills I had learned in New York, but with artists unable to mingle at local bars and coffee shops, shop in the same stores, sleep in the same streets and do their art closest to each other and the irreplaceable institutions of art that only exist in our major cities, there will never be a movement in Art like we have come to expect from centuries of progress, lost forever, to the Gentry? As I sit among you and face the rapid onslaught of 2013, I wonder just how well Art will fare? With university pedantry in control of Collector money, the clear result will be a vacancy on the part of collectible work, an emphasis of "masturbation" as a means to some sort of conceptual "formalism"; meaning no progress. Should art be devoid of progress? I would love to hear from artists. When I was an art teacher, I always taught of the time in History, when Art was as integrated in society as is photography. Look around at the proliferation of photography everywhere and try to imagine a time when there were equal amounts of hand-made visual art in its place, if you can. Archeologists discovered the Cave Paintings at Lascaux, France in 1940. Those haunting images come to us from the Upper Paleolithic age over 17,000 years ago. The well-drawn, sophisticated renderings bespeak a history of this kind of drawing; a style had to have been taught and learned to achieve that level of accomplishment. Artists were tolerated, nay, supported, for their keen contribution; they left a record of the daily life of the hunter-gatherers, one the non-artists understood easily, and those non-artists appreciated the work, yes, the work, the artists did, that now had a place in the daily life of people who had just made the leap that fire afforded and could reside now in the great caves and caverns. Without fire, those were the denizens of the fiercest predators, until fire lighted the way, scaring them, and creating our first permanent housing. Such appreciation disappeared in 1830 when photography reared its head...that was the beginning, the proverbial writing on the wall. By the end of the 19th century artists that had fruitful occupations lost their market entirely. It drove many to the brink of disaster, others to suicide. For thousands of years we were fruitful and suddenly assigned to garrets making art for its own sake, forgetting our past, lurching in awkward ways into an uncertain future.